Despite curbing my Etsy business recently, I have managed to stay pretty busy with lots of other fun projects. I finished these two Halloween Minnie and Mickey dresses. The Minnie one sold and has made its way to its new owner in Canada. (The Mickey one on the right is still available! 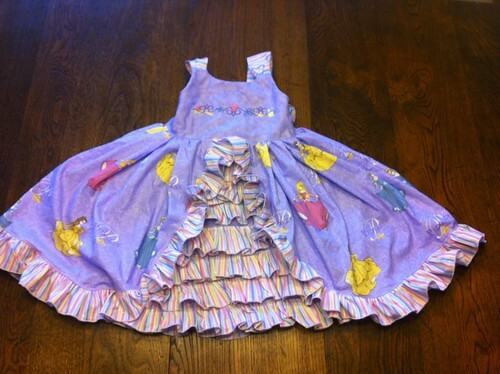 Size 4) These are incredibly fun dresses with lots of great colors and details. 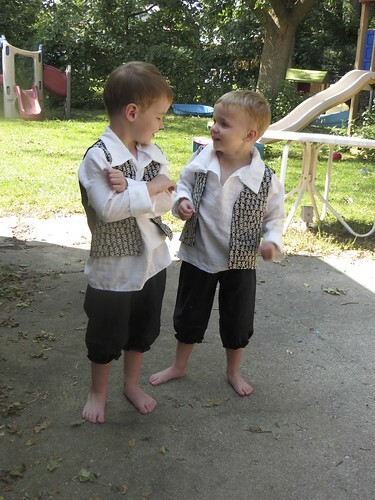 These sets were a birthday gift for twin playmates. 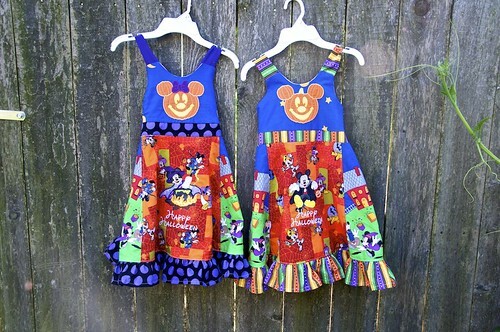 I made Minnie Mouse dresses for their birthday last year. 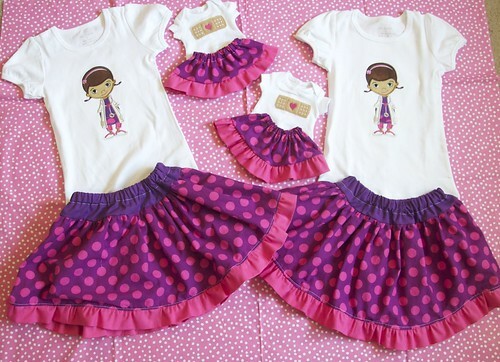 This year they love Doc McStuffins so when I found that purple and pink polka dots I knew it was perfect for Doc. They even got corresponding outfits for their dolls. These outfits call into the “Giving Back” category, they went to a family for a Make a Wish trip. The little girl is 4 and has leukemia. 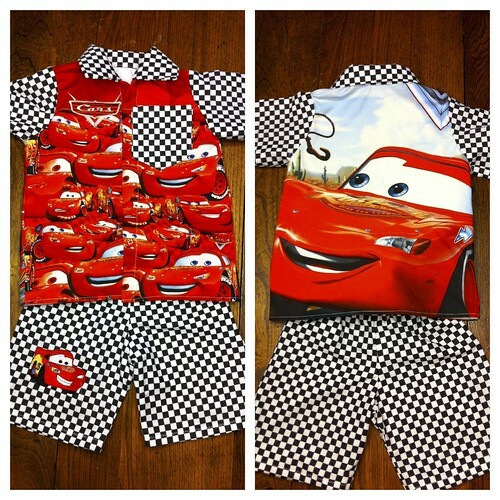 She has an almost-3-year-old brother, so they each got a special outfit. The girl’s mom sent me a message saying that her daughter declared it the best dress ever and that the princesses at Disney World will know she is a princess too. Neither one of the kids wanted to take their outfits off. 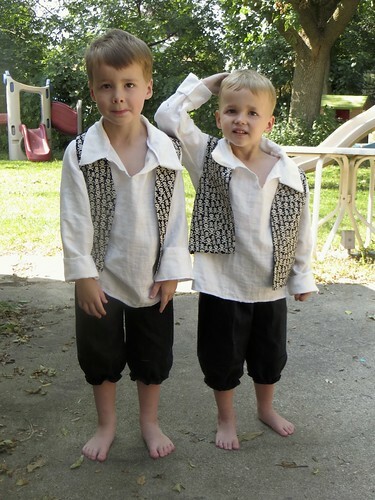 And this swashbuckling duo is getting ready for a Disney trip too, these are their outfits for their Pirate makeover at Pirates League when we visit over Halloween for their 4th birthday. 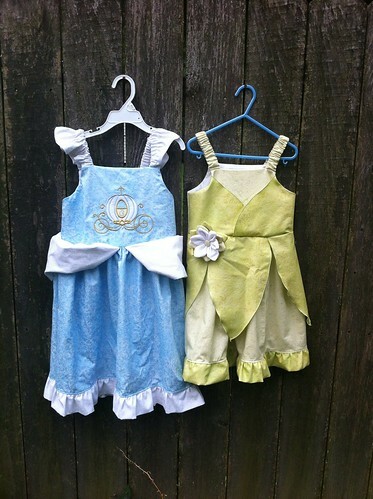 And one more set of Disney-inspired sibling set, these dresses were made for a college-friend’s daughters. They just got back from their trip and I am told the dresses were a hit. Her younger daughter reportedly told Tiana all about the dress, even though she wasn’t wearing it at the time. I am off next week to Sewing Summit, but I am hoping I can start ramping up my business again now that my kiddos are spending at least a little time in preschool, and the holidays are on the way. I just received the Christmas PJs so I will be starting on those in the next couple weeks. If you pre-ordered holiday pajamas, keep an eye out for an email to finalize your designs.